The Millionaire was specifically designed for making multiplication easy, though it is capable of the standard four functions (+, -, x, ÷). The mechanism was designed by Otto Steiger, a Swiss engineer, and was patented in Germany in 1892. Manufacture started in 1893, and from 1899 was handled by Hans W. Egli of Zürich, Switzerland, until production ceased in 1935. These machines were large, heavy, and expensive, and from 1911 H.W. Egli introduced the more compact MADAS mechanical calculators based on the stepped-drum mechanism, which the company continued to develop into the 1960s. The operation of the Millionaire is based on a set of sliding racks which are driven across pinions by the operating crank. The set of racks is under the sliders, at top middle, which are used to set the number to be multiplied. The starting position of each rack is determined by the number set on the multiplier lever, at top left, which positions the appropriate set of starting rods against the ends of the racks and so offsets them as necessary. A single turn of the crank multiplies the number set on the sliders by the number (0 to 9) set on the multiplier lever and the result is displayed in the result register, the bottom row of number windows. The result register is shifted one place to the left so that the operation can be repeated with the next digit of the multiplier, and so on. In this way two large numbers can be multiplied together very quickly. Various models were produced, some with the sliders replaced with a keyboard, some electrically driven, and some double-register ones. The history of The Millionaire and the transition to the MADAS is told in detail on Gérald Saudan's excellent site at http://www.madas.ch/. "Millionaire" (also available from Gérald Saudan's site) shows in detail the parts of the mechanism as they operate. "The Millionaire Machine" shows parts of the mechanism and the operation of the machine. "The Millionaire" explains the direct multiplication mechanism and demonstrates the operation of multiplication, addition, and subtraction. 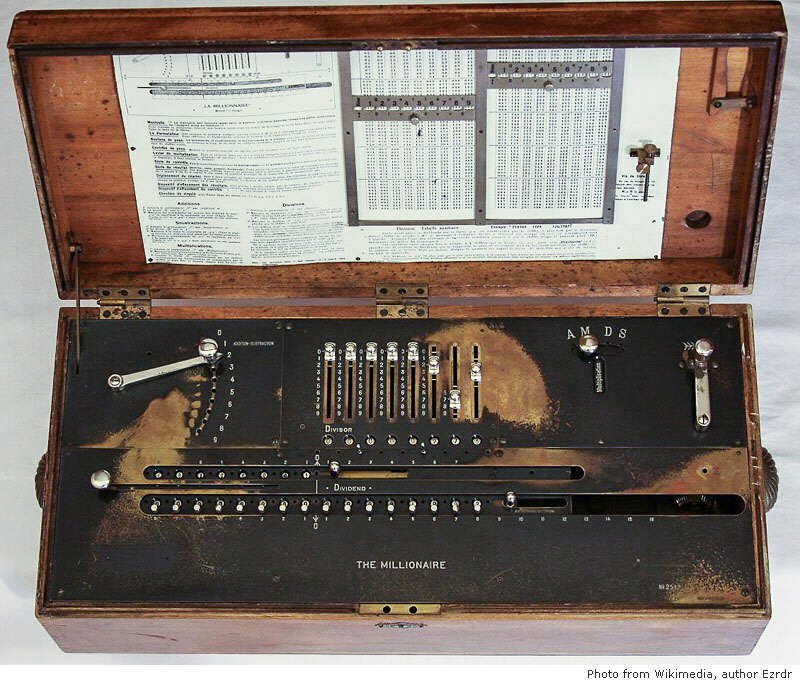 "Double Millionaire Calculator" shows the operation of an electrically-driven Double Millionaire.